Last week, John Paul was interviewed by Tim Bourquin at Trader Interviews where he shared a few price action strategies you don’t want to miss! Take the time to listen; it will be worth your while! Good interview, great content. 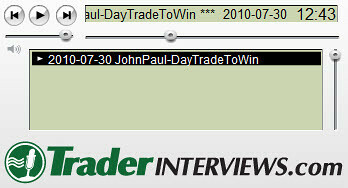 Trading with the ATO has allowed me consistent wins on the emini. Been trading for years and tried numerous methods. Thanks again! thanks daytrade to win for everything you do! i’ve been price action day trading the emini in the mornings with the ato and already have doubled my account,,, everybody there is terrific and nate is awesome! Wow really great interview!! Thanks for the information.